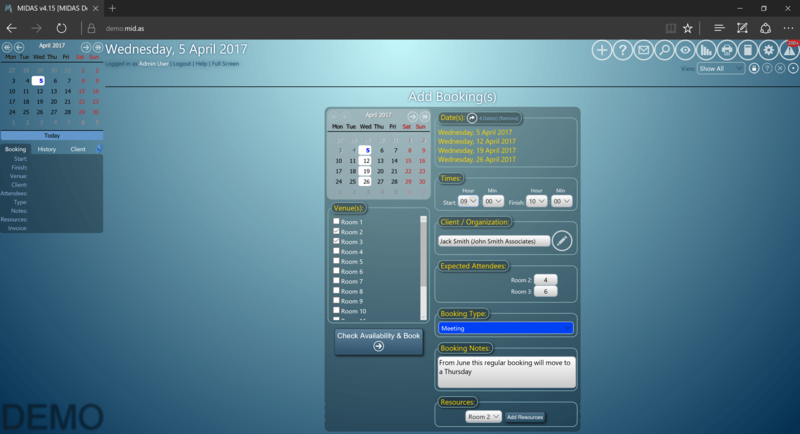 MIDAS is a powerful and intuitive browser-based scheduling system that enables complete control over room bookings and resource scheduling. Accessed entirely from any web browser, users can see at a glance when bookings are scheduled, manage staffing and equipment, send confirmations and invoices to clients, and take booking requests online through a website. The MIDAS booking system is readily available anywhere on a desktop, laptop, tablet, or mobile device. MIDAS can be downloaded and run on a company’s own server, or as cloud hosted SaaS (Software as a Service) MIDAS helps cuts costs by streamlining the time spent on booking & administrative tasks, and reducing paperwork. It’s suited for any facility with rooms to book. Features include daily, multi-day, and monthly views of bookings, integrated invoicing, online payments, graphical statistics and reports, automated booking and invoice reminders, customized templates, integrated invoicing and online payments, and the ability to email and invoice clients directly. MIDAS allows users to print bookings for a particular date or date range. Customized filters allow printing selections of rooms rather than all room, or to print out details of client’s past or future bookings. In an emergency situation an instant printout can be made with the estimated number and location of people onsite. A client database allows for searching, adding, or modifying clients, viewing their history, or email them directly. A scheduling grid allows for similar rooms to be grouped together and filtered for display. Bookings can be color coded for easier distinction on screen. Discounted rates can be assigned by booking type. Not sure MIDAS is right for your business? Use our Property Management Software Product Selection Tool to compare other Property Management Software solutions. Have questions? Call or email one of our unbiased Technology Advisers for a free consultation. Learn everything you need to know about MIDAS Sales. Our experts will reach out to you shortly.